Our next spotlight artists are the Japanese female rock group, The Suzan. Their latest album, “Golden Week For The Poco Poco Beat”, was produced by Bjorn Yttling of Peter Bjorn and John. They recently performed at the Concert for Japan at the Japan Society, and are included in the line-up for Brooklyn ♥ Japan benefit tonight at The Bell House.Thanks to Dana Meyerson of Biz 3 for arranging the interview. NICO : DrumsHow did your band’s name come about? We have sisters in the band. And their nick name is SUZAN which come from their last name. 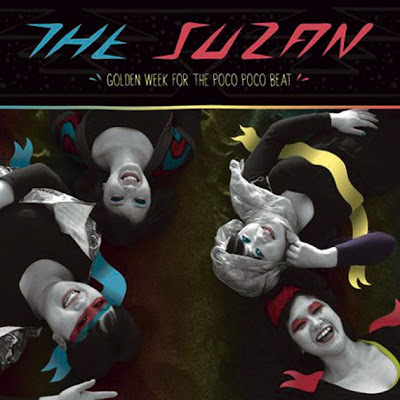 Our new album “Golden Week For The Poco Poco Beat” makes you feel happy whenever you listen to it! How long did it take to record the new album, “Golden Week for the Poco Poco Beat”? What does the title mean? It took almost 2 weeks. We did recording in Stockholm. As for the title, “Golden Week” is actually Japanese-English, and we Japanese have “Golden Week” in May: long holidays. And our producer Bjorn loves that word. “Poco Poco” is expressing our sounds. How is the tour going? How are American audiences different to performing in Japan. There’s not much different to enjoy their feelings for our performance between American audiences and Japanese ones. But American audiences are good to express their excited feelings and also have attitudes to receive what they like honestly even if they don’t know us. Japanese audience’s passions are so strong, same as American audiences. They need enough time till they express their feelings after show is started. When we finish every show, many audiences try to talk to us and shoot photos. They make lines to shoot photos. It’s good for us and makes us feel like being idols. So funny! YOU CAN DO IT! YOU MUST DO IT! We have some gigs in NYC. And, we hope to trip around the world to play gigs! Can you recommend any other act(s) we could feature on MurphGuide? We want to recommend “Peter Bjorn and John“!!!! Their new album “GIMME SOME” is amazing. We listen to it every morning in our home. The Suzan will be performing at a benefit for Japan tonight, Friday, April 15. The Suzan will also perform on Saturday, April 30 at The Music Hall of Williamsburg.